Well it arrived, like a wonderful late christmas present. 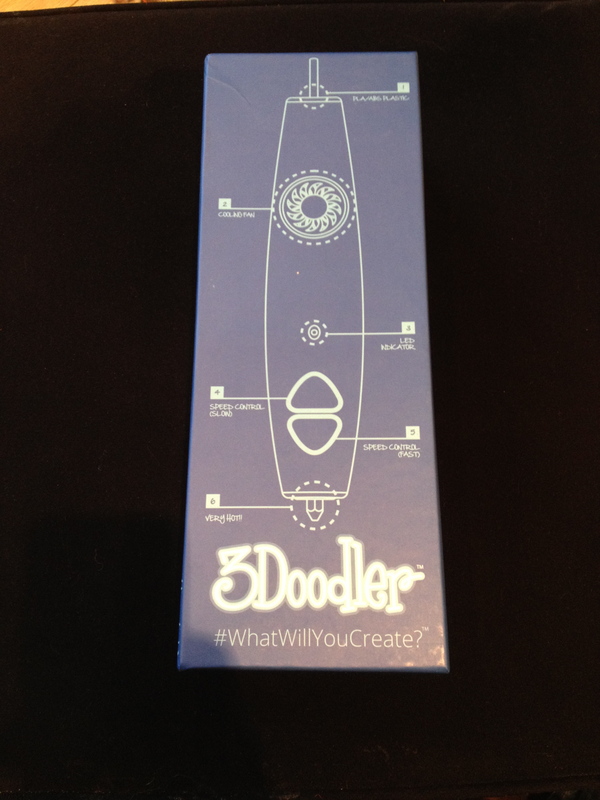 My first Kickstarter investment, the awe inspiring 3Doodler. Its closest cousin outside the high tech world of 3D printing is the humble hot glue gun. 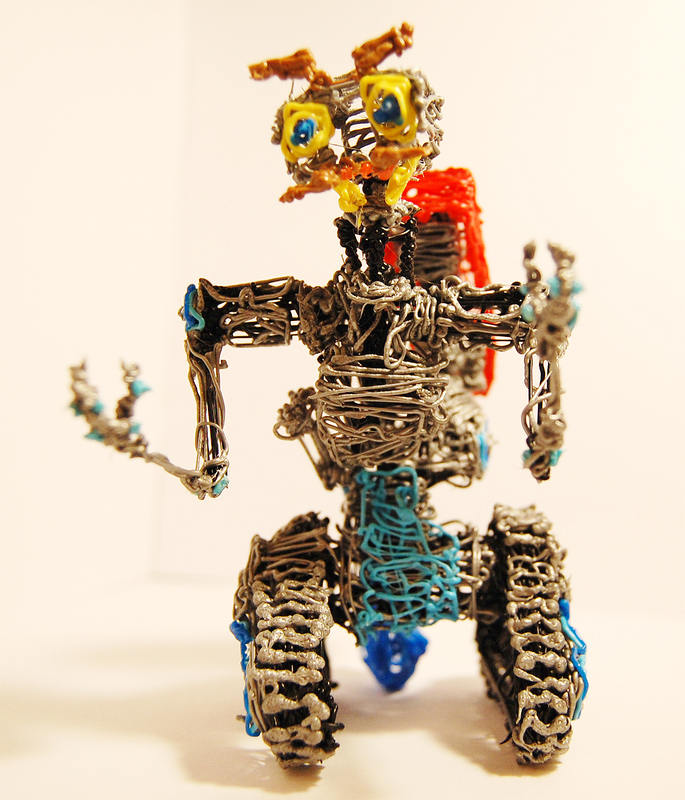 Using the 3Doodler is reminiscent of squeezing that solid glue through a hot nozzle. In the case of the 3Doodler it is a much more controlled and precise device. It has a built in fan and feed motor, two buttons on the side control the feed of a 3mm filament of plastic. A little blue and red light on the side let you know when its ready to use and a slide switch lets you simply configure the pen for PLA or ABS plastic. Out of the box I got the 3Doodler pen, a power adapter, a few packets of ABS plastic and an instruction manual. I had already received very welcoming emails encouraging me to to watch instructional videos which were very short and very informative allowing me to get started in minutes. After a few little doodles including a little heart and a flower declaring my love to my wonderful wife Sarah. I wonder …“what shall I make”. As I grew up on a farm the answer was immediately obvious, I checked the packs for suitable green and yellow filaments with which to craft my first masterpiece and set to. It came together with relative ease, I wasn’t going to win any prizes for precision but that wasn’t the aim with my first foray. I was pleasantly surprised and proud of the level of detail I could produce with the 3Doodler. You cant see it in this picture but I included a full rear pick up hitch linkage on the back of my little John Deere tractor. I even finished the little fella off with a sat nav dome on the roof! Already hooked by the new device I pondered what was next on my build list… It came to me one evening whilst Sarah was away with work and I was catching up on some old films recorded over Christmas. Short Circuit of course! I made it ten minutes into the film before rushing around, grabbing my 3Doodler, a dinner tray and a square lined note pad so I could doodle away whilst the film played. It took most of the evening but I was happy with the result. Johnny 5 is alive! And he used a lot of my ABS plastic! Material supply was evidently going to be an issue, I didn’t want to wait for weeks for more filament from Wobble Works so I turned to the internet which always seems to have an answer for everything. 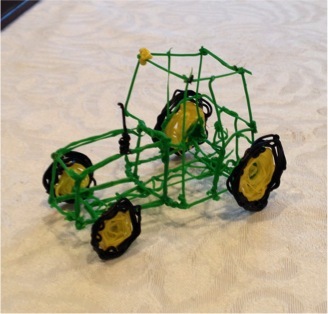 The 3Doodler used 3mm ABS or PLA filament. Official advice is that standard filament spools used in 3D printing will work but needs to be cut into lengths that the pen can handle (something to do with the power of the motors). I quickly found relatively cheap and readily available 10m sample spools of ABS on Amazon and ordered some up to try it out. Once the spools had arrived I tried them out and all seems ok so away I go. The quality isn’t as good as the branded filament, it seems the feed is not as consistent but the difference is minor and it works fine for my needs. Now liberated from the worry of running out of ABS. FANTASTIC! lets build a plane. 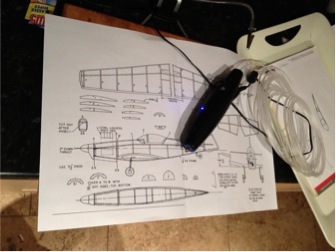 I once made a balsa wood plane as a child and wondered if I could find some model plans online? ← Projecting into your EYES! It is the start of a wonderful journey! Ship has set sail and port is disappearing over the horizon 🙂 Although I think its more analogous to say I am returning to port to stock up with supplies that are apparently essential to the journey. Whilst its in dock the ship could do with a few upgrades to give it half a chance of making it across the ocean of internet without sinking into the abyss of obscurity!… oh and if possible convince some other people to join the fleet. So what do you say Patrick are you onboard or even better build your own ship and join the fleet!